Photo of the National Park Jumonville Glenn outside plaque by: Christopher, Fort Couch Middle School, Upper St. Clair Pennsylvania. A few days after the incident, this is how George Washington described his first experience under fire. The shots at Jumonville Glen were the first in the Fort Necessity campaign, ultimately leading the world to war. But the story of Jumonville Glen has the intrigue of a mystery thriller and contains controversy and unanswered questions. George Washington had been sent to the Ohio country as a British emissary in the winter of 1753-54 to tell the French, who had been building forts in the area, to leave. French officers politely told Washington they were not obliged to obey his summons, and they were going to stay. Washington returned to Virginia and informed Governor Robert Dinwiddie that the French refused to leave. The governor immediately assembled a force of men to go to the Ohio River and construct a fort. Washington, as the lieutenant colonel of the Virginia Regiment, was to gather men and supplies and build a road to the forks, reinforcing the men who were there. By late May, Washington had reached a large natural clearing known as the Great Meadows. He made this his base camp. Grass there could provide food for his animals, and water was readily available. Soon after he arrived, he received word that a party of French soldiers was camped in a ravine not far from his position. On the stormy night of May 27th, 1754, Washington and about 40 men began an all night march to confront the French and learn their intentions. They traveled through woods so dark the men sometimes spent nearly half and hour just trying to find the trail. About dawn, Washington met with a friendly Seneca chief, Half King, and made plans to contact the French Camp. As the French commander had not posted sentries, Washington and his men easily surrounded the unsuspecting French. A shot was fired, no one really knows by whom, and soon the peaceful glen was filled with the crash of musketry and the sulphurous smell of powder. The skirmish lasted about 15 minutes. When it was over, 10 Frenchmen were dead and 21 captured. One escaped and made his way back to Fort Duquesne at the forks of the Ohio. Washington's casualties were one man killed and two or three wounded. Washington now knew he was discovered. He sent his prisoners to Williamsburg while he returned to the Great Meadows. There he started construction of a small fortification to protect from probable attack. About five weeks later the attack came. A larger force of French and Indians attacked Washington's force of 400 at his "Fort of Necessity." 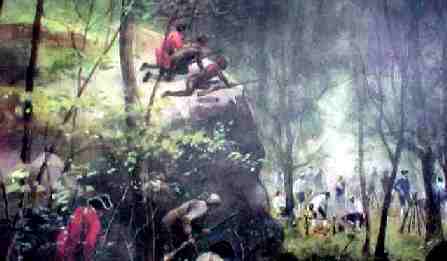 Controversy surrounds the events that took place at Jumonville Glen, named after the leader of the French detachment, who was killed there. Soon after the smoke had cleared, French survivors claimed they had been attacked without cause by Washington. They claimed they were on the same sort of mission Washington himself had been on the winter before. That explained, they said, why they had been so easily surprised and why they had not posted sentries. Washington asked why, if the French were on a diplomatic mission, they were hidden in a ravine, off the trail, and present in the area for perhaps a couple of days without approaching him. The skirmish at Jumonville returned to haunt Washington sooner than he thought. After an all day battle at Fort Necessity on July 3rd, Washington surrendered his command to the French. That night he signed a multi-part document, one clause of which stated that he was guilty of the assassination of a French officer, Jumonville. Washington denied this. He said the translation he had been given was not "assassination", but "death of" or "killing." In any event, the French used this propaganda to great advantage in efforts to discredit the English. British statesman Horace Walpole wrote in later years, "The volley fired by a young Virginian in the backwoods of America set the world on fire." 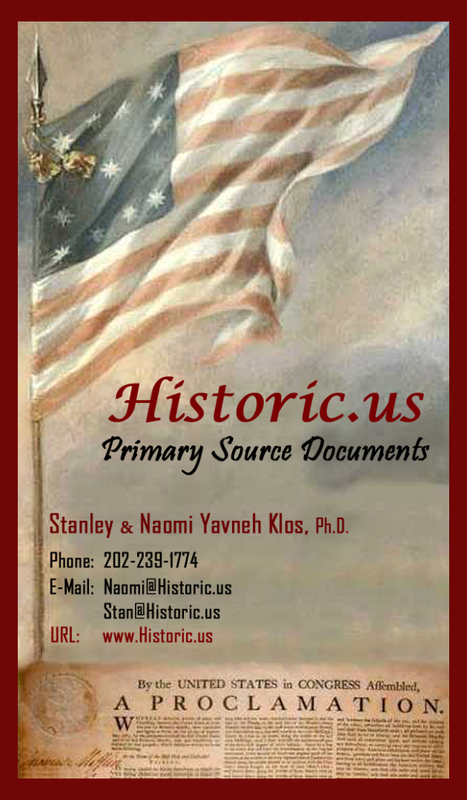 The outcome of the volley, the French and Indian War, would have great impact on global affairs. France lost most of her influence in North America, while English colonies in America began to pay taxes levied upon them to help pay for what had been an expensive war. Some people began to dream of independence. *Republican Party - - the political Party organized by Thomas Jefferson and James Madison in 1791 that went out of existence over the schism between John Quincy Adams and Andrew Jackson. Today, for the sake of expediency, political scientists incorrectly refer to it as the Democratic-Republican Party. Party Members at the time never utilized the name Democratic-Republican because it was the Republican Party.